Winter weather advisory in effect for Sunday morning – Welcome to Wyandotte Daily! A winter weather advisory will be in effect from midnight through noon Sunday, according to the National Weather Service. 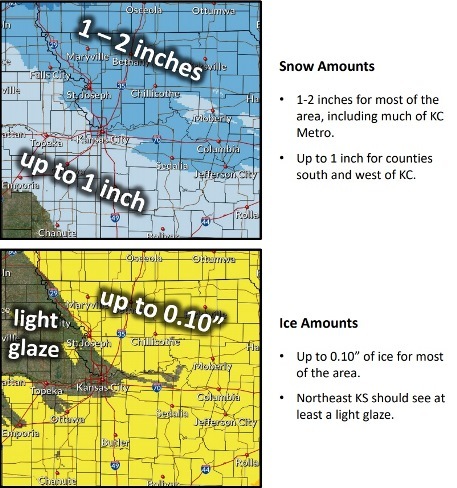 Mixed precipitation is expected, with expected total snow accumulation of up to 1 inch and ice accumulation of a light glaze, according to the weather service. The weather service said periods of snow, sleet or freezing rain may cause travel difficulties. Motorists should expect slippery roads and limited visibility, and use caution while driving. Snow may fall between 1 a.m. and 9 a.m. Sunday, according to the forecast. Freezing rain may fall from 7:30 a.m. through 10 a.m. Sunday. Forecasters said light snow will move northeast into the area, then it will transition to a wintry mix. Around noon, the wintry mix may change to drizzle, according to the weather service, exiting the area shortly after noon. Temperatures will be about 28 degrees at 7 a.m., rising to 32 degrees at 10 a.m., then 35 degrees at noon and 37 degrees by 3 p.m., according to the weather service. The overnight low will be around 26, with a southeast wind of 9 mph, according to the weather service. There is a 100 percent chance of precipitation. Sunday, the high will be near 37 with a south southwest wind of 5 to 11 mph, the weather service said. There is a 40 percent chance of precipitation. 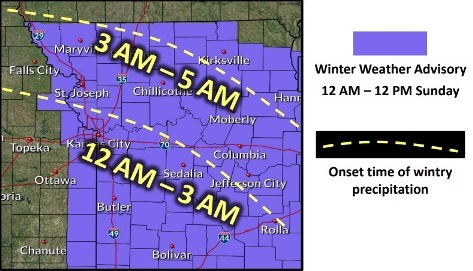 Sunday night, there is a 40 percent chance of freezing drizzle and sleet before 2 a.m., then a chance of sleet between 2 a.m. and 5 a.m., followed by freezing drizzle and sleet after 5 a.m., according to the weather service. The low will be around 30, with an east wind of 3 to 8 mph. Monday, there is a 70 percent chance of freezing drizzle and sleet before 8 a.m., then a chance of drizzle between 8 a.m. and noon, followed by rain after noon, the weather service said. The high will be near 40 with an east wind of 7 to 9 mph. Monday night, there is a 60 percent chance of rain before 1 a.m., then a chance of drizzle and snow between 1 a.m. and 3 a.m., then a chance of snow after 3 a.m., according to the weather service. The low will be around 29 with an east southeast wind of 6 to 16 mph becoming west northwest after midnight. Winds may gust as high as 29 mph. Tuesday, it will be mostly sunny with a high of 38, the weather service said.